Stadtallendorf/Friedberg, Germany, March 8th, 2013 – Federal-Mogul Corporation (FDML: NASDAQ) will exhibit a range of maintenance reducing technologies at the 2013 BAUMA Trade Fair in Munich from April 15-21 (booth A5.220). The technologies include new Goetze® dirt-resistant HSL-series face seals and GLYCODUR® lead-free bearing technology developed for the most arduous operating conditions. 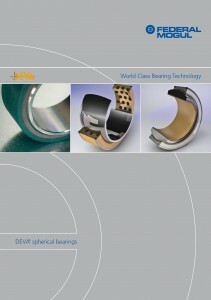 A comprehensive spherical bearing catalogue and application guide from DEVA® will also be presented at the event. The innovations shown at BAUMA 2013 are targeted at reducing environmental impact and elongating maintenance intervals. Helping customers meet future regulations and corporate environmental targets is a key part of Federal-Mogul’s strategy for technological leadership. A development of the proven square bore series face seals, the new HSL seals from Goetze incorporates a dirt excluder lip within the design to set a new standard in the protection of sensitive machine components when operating in wet and muddy environments. Currently undergoing advance testing with specific customers, the new seal type increases resistance against mud packing that could otherwise lead to subsequent leakage when particles can be pressed into the gap between the seal rings. A range of sizes up to 1.500 mm in diameter will be available. To provide customers with a quicker, more convenient method of identifying a suitable product for their application, DEVA has launched a new, comprehensive catalogue and application guide, covering all the company’s bearing types and materials. It helps customers to make an initial selection that is followed up by specialist applications engineers to ensure an optimum choice. The catalogue will be available from the Federal-Mogul booth at the BAUMA show. Federal-Mogul will display two varieties of its new GLYCODUR lead-free bearing technology, developed for various industrial applications. GLYCODUR F is a sliding bearing that consists of a steel base to which a porous tin bronze material is sintered on top of. The pores are filled with polytetrafluoroethylene (PTFE) and other friction and wear reducing additives which makes it suitable for applications with high demand on service life. For continuous operation in high-loaded applications, such as joints in construction machines, Federal-Mogul has produced GLYCODUR A, a sliding bearing with a steel base and a polyoxymethylene (POM) top layer, which is solidly joined to the sintered bronze. Federal-Mogul Corporation (NASDAQ: FDML) is a leading global supplier of products and services to the world’s manufacturers and servicers of vehicles and equipment in the automotive, light, medium and heavy-duty commercial, marine, rail, aerospace, power generation and industrial markets. The company’s products and services enable improved fuel economy, reduced emissions and enhanced vehicle safety. Federal-Mogul operates two independent business segments, each with a chief executive officer reporting to Federal-Mogul’s Board of Directors. Federal-Mogul’s Powertrain Segment designs and manufactures original equipment powertrain components and systems protection products for automotive, heavy-duty, industrial and transport applications. Federal-Mogul’s Vehicle Component Solutions Segment sells and distributes a broad portfolio of products through more than 20 of the world’s most recognized brands in the global vehicle aftermarket, while also serving original equipment vehicle manufacturers with products including braking, chassis, wipers and other vehicle components. The company’s aftermarket brands include ANCO® wiper blades; Champion® spark plugs, wipers and filters; AE®, Fel-Pro®, FP Diesel® Goetze®, Glyco®, Nüral®, Payen® and Sealed Power® engine products; MOOG® steering and suspension parts; and Ferodo® and Wagner® brake products. Federal-Mogul was founded in Detroit in 1899. The company employs 45,000 people in 34 countries, and its worldwide headquarters is in Southfield, Michigan, United States. For more information, please visit www.federalmogul.com.